Prime Rib. It’s right there in our name. But there’s so much that goes into making that cut of meat just right before its delivered to your table. For instance, did you know that each prime rib is wet-aged for 28 days and then dry-aged for another 5? Or that it’s slow roasted and carved to order? 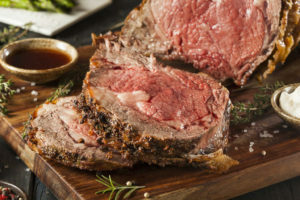 Coming in sizes of eight ounces, 12 ounces and 16 ounces, Clyde’s prime rib come with a side of mashed potatoes, French fries or herbed rice. And if it’s after 5 p.m., you can order a loaded baked potato. But the best way to enjoy your cut is to pair it with some Main Lobster. And remember, you can always pre-game your prime rib by starting off the night with a bite-sized prime rib appetizer.